Lakeside Lutheran High School is pleased to announce that two seniors have signed their national letters of intent on November 11 to play college basketball next year. Seated with Lakeside Lutheran senior Abby Monis as she signs her national letter of intent for basketball for the Maryville University Saints is her mom Trisha. Standing behind them are her freshman brother Jack, father Peder and Warrior girls basketball head coach Tim Matthies. Abby Monis, daughter of Peder and Trisha Monis, Oconomowoc, was recruited by Division 2 Maryville University in St. Louis. According to Maryville’s stats, the 6-foot-1 Monis averaged 17 points and six rebounds per game in earning first-team All-Capitol North All Conference and Wisconsin All-State honors last season. She was named to the Midwest Basketball Report Wisconsin Top 25 of 2015. Monis also played AAU for the prestigious Wisconsin Lakers basketball club in the summer of 2015. At Lakeside, she has played four years of basketball as a Warrior, along with two years each on the volleyball and track and field teams. Meghan Pingel, daughter of Jim and Renae Pingel of Sun Prairie, signed her acceptance to be a point guard for the UW Green Bay Phoenix women’s basketball team. As a Warrior guard, the 5-foot-8 Pingel has been awarded Capitol North All-Conference team spots for each of her three previous years, from an honorable mention her freshman year, to 2nd team in 2013-14, to 1st team last season. She has helped lead her team to the top of the conference each year. Pingel has been a three-sport athlete for Lakeside Lutheran, on the volleyball, basketball and track teams, and has earned All-Conference, All-State and team awards for each sport she has participated in. She has captured several State medals as a runner, triple-jumper and hurdler, earning her the title of Capitol Conference Track Performer of the Year for both 2014 and 2015. Lakeside Lutheran athletes were recognized at the recent fall sports awards night as they were awarded titles of honorary captains or most valuable member by their teams, or as they were awarded spots on Capitol North All-Conference teams (front, l-r): Jennica Jensen, cross country MVR and 1st team all-conference; Patience Letko, 2nd team, volleyball and honorary team captain; Zech Schleef, 2nd team soccer; Griffin Torgerson, honorable mention soccer; Jonathan Kroeger, 1st team soccer; Josh Higgins, honorable mention soccer, team MVP; Conrad Schaalma, 1st team football offense. Second row, L-R: Kendal Densen, 1st team volleyball; Amber Rowoldt, 1st team volleyball, WVCA All-State Honorable Mention, team MVP; Jacob Constien, 2nd team football defense; Joe Graumann, Capitol North Conference Player of the Year, 1st team soccer, team honorary captain; Tim Hodel, honorable mention soccer; Robbie Jarnigo, 2nd team, soccer; Nathan Lemke, 1st team soccer; Eli Gartner, honorable mention, soccer. Third row, L-R: Kaitlyn Gehler, 2nd team volleyball; Blake Thiele, 1st team football defense, 1st team football offense, football honorary team captain; Jared Traver, honorable mention, football defense; Jaden Schmidt, honorable mention, football defense; Nick Chesterman, honorable mention, football offense; Stephen Phelps, 1st team soccer; Elijah Tesch, 1st team cross country. Back row, L-R: Ellie Westrate, 2nd team volleyball; Lydia Ulrich, 2nd team cross country, honorary team captain; Mitchell Georgi, Capitol North Conference Runner of the Year, 1st team cross country, team MVR; Reynaldo Leon Peralta, 2nd team football defense; Mason DeNoyer, honorable mention, football offense; Austin DeNoyer, 1st team footbal l offense, 2nd team football defense,team MVP; Hollie Doyle, golf honorary team captain. Not pictured is Annika Butzow, golf team MVP. Lakeside Lutheran High School recently held its fall sports awards night when coaches recognized captains and MVPs from six teams as well as all-conference team honorees and athletes of the year. A total of 12 Lakeside Lutheran athletes received first team all-conference spots, 13 achieved second team all-conference, and eight earned honorable mention. 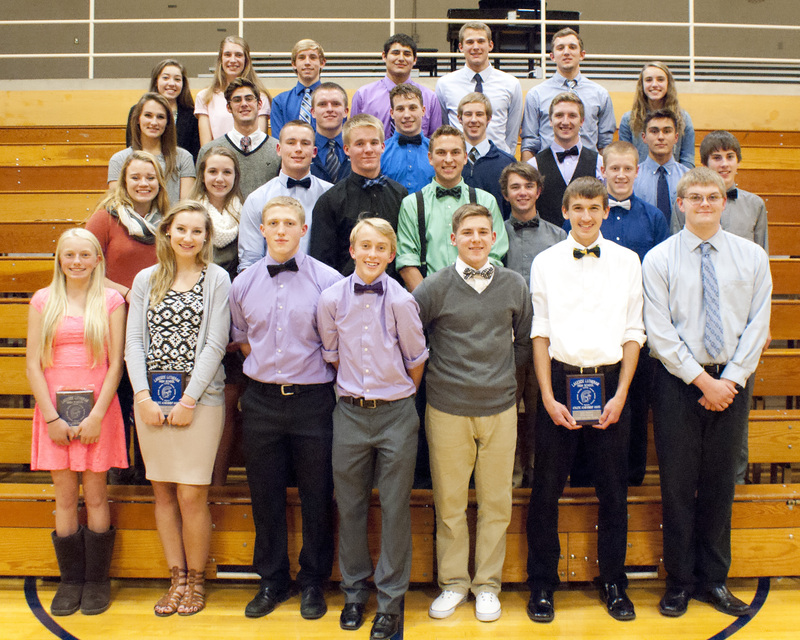 In addition, two Warriors received Capitol Conference North Athlete of the Year honors. Junior runner Mitchell Georgi of Sun Prairie was named Capitol Conference North Runner of the Year in cross country. He also earned a spot on 1st Team All-Conference, and was voted the team’s most valuable runner by his running mates and coaches. Georgi won two invitationals, at Lodi and at Poynette, early in the season. He finished third overall at the sectional meet at Pewaukee to be the first Lakeside runner to compete in the state meet since 2012. Senior runner Elijah Tesch of Sun Prairie also received first team all-conference honors and was named this year’s honorary team captain. Junior Ben Tweit of Madison and sophomore Charlie Pingel of Sun Prairie earned second team all conference honors. Freshman cross country runner Jennica Jensen of Juneau was named to the girls 1st All-Conference Team, and was voted the team’s most valuable runner. Senior Lydia Ulrich of Jefferson earned second team all-conference honors was voted honorary captain of this year’s girls team. Senior Rachel Manteufel of Columbus and freshman Kira Tweit of Madison were also honored with spots on second team all-conference. The Lakeside Lutheran boys soccer team claimed the Capitol Conference North title this fall with a undefeated conference record of 5-0, and took its fourth straight regional championship. Capitol Conference North Player of the Year was awarded to senior forward Joe Graumann of Fort Atkinson, who finished the season with 33 goals and 3 assists. Graumann also earned 1st team All-Conference honors and title of honorary captain from his own team. Nine other soccer players received conference honors, including senior midfielders Jon Kroeger of Beaver Dam and senior Nate Lemke of Jefferson, and senior defender Stephen Phelps of Stoughton, who also earned 1st team honors along with Graumann. Senior defender Robbie Jarnigo and junior forward Zech Schleef, Watertown, earned 2nd team honors, and senior defender Tim Hodel of Lake Mills, junior midfielder Eli Gartner, junior keeper Josh Higgins and sophomore Griffin Torgerson, all from Watertown, received honorable mention. Higgins was voted team MVP by his teammates. The Lakeside Lutheran volleyball team also claimed the Capitol Conference North championship this fall with a conference record of 9-1. Five players earned spots on conference teams for their efforts. Senior defensive specialist Kendal Denson of Sun Prairie and sophomore outside hitter Amber Rowoldt of Watertown earned places on 1st team all-conference. Rowoldt also received All-State Honorable Mention from the Wisconsin Volleyball Coaches Association (WVCA) and was voted MVP by her own team. Senior middle hitter Patience Letko, Lake Mills, sophomore defensive specialist and hitter Kaitlyn Gehler of Waterloo, and sophomore setter Ellie Westrate of Sun Prairie claimed spots on 2nd team all-conference. Letko was voted the year’s honorary team captain. In football, nine players earned eleven spots on all-conference teams. Senior wide receiver and defensive back Blake Thiele of Oconomowoc earned first team all-conference for both his offensive and defensive positions. Senior running back and defensive back Austin DeNoyer earned 1st team honors for his offensive and 2nd team for his defensive position. Joining them on 1st team all-conference was senior offensive lineman Conrad Schaalma of Juneau. Earning 2nd team spots were senior middle linebacker Reynaldo Leon Peralta, Madison, and junior defensive end Jake Constien of Sun Prairie. Receiving honorable mention were senior defensive end Jared Traver, Janesville, junior quarterback Nick Chesterman and senior tight end Mason DeNoyer, both of Sun Prairie, and junior middle linebacker Jaden Schmidt, Watertown. Austin DeNoyer was voted the Lakeside Lutheran 2015 most valuable player, and Thiele received the title of honorary team captain. Lakeside revived its girls golf team this fall, and awarded senior Hollie Doyle of Watertown the title of honorary team captain. Junior golfer Annika Butzow of Janesville was voted team Most Valuable Golfer. 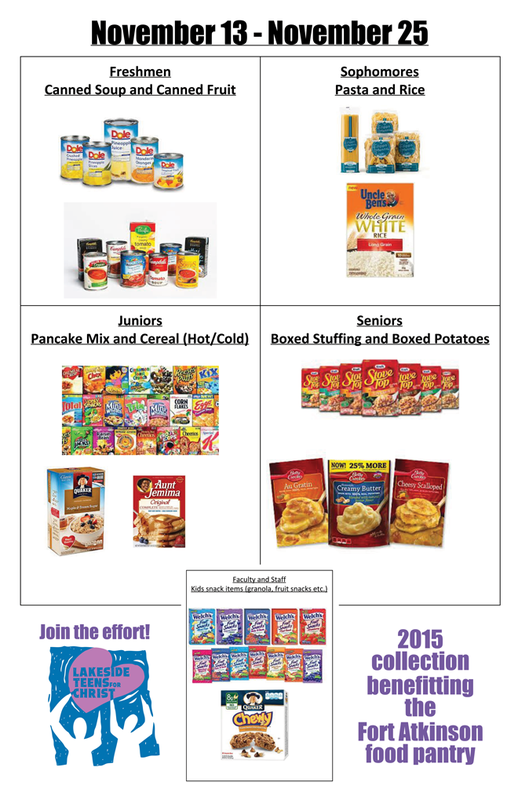 The Warrior Dance team instituted a new team award this fall during its awards night held later in the week. The Christian Leadership, Growth and Development Award was given to senior Ashley Kohls of Waterloo. For the football season, senior Clarissa Keller of Middleton was named Most Valuable Dancer, and senior Becca Doering of Lake Mills was voted honorary team captain. Lakeside Lutheran High School hosted a Veterans Day event Friday, November 6, that featured an introduction to and speech from Rep. Cody Horlacher, state representative for Wisconsin’s 33rd Assembly District, which includes the cities of Jefferson and Fort Atkinson, among other areas in southeastern Wisconsin. 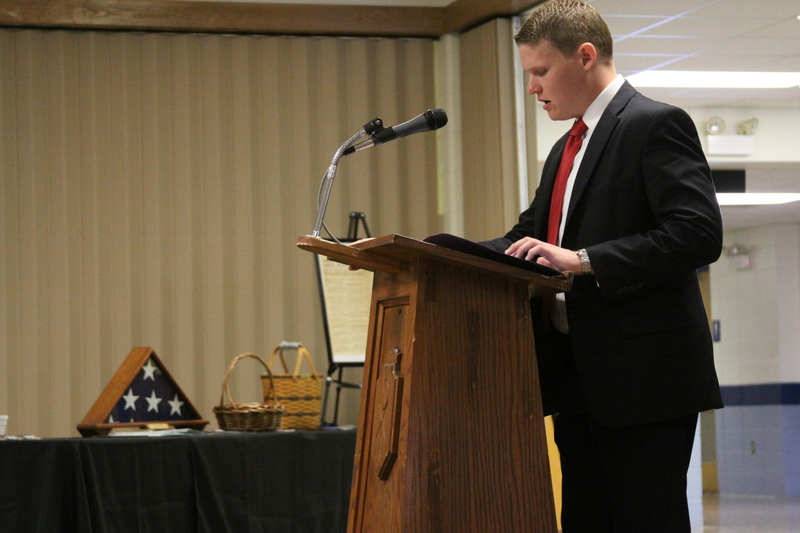 Wisconsin 33rd Assembly District Rep. Cody Horlacher addresses attendees at the Lakeside Lutheran Veterans Day observance on Friday Nov. 6. More than 100 veterans from several branches of service spent the morning at Lakeside. The veterans in attendance represented more than half a century of military service, from World War II to the conflicts and wars in Korea, Vietnam , the Persian Gulf, Iraq and Afghanistan. After a breakfast and social time for veterans and their guests, Principal James Grasby greeted the veterans and introduced Rep. Horlacher, who serves on several legislative committees, including Campaigns and Elections; Constitution and Ethics; Criminal Justice and Public Safety; Education; Interstate Affairs; and the Committee on Judiciary, for which he serves as the Vice Chair. Rep. Horlacher expressed his thanks to the veterans in attendance and to those currently serving, and commemorated the selflessness that is required in service to God and country. A special Veterans Day chapel service, presided over by Pastor Matt Krenke of St. John Lutheran Church in Jefferson and Pastor Mark Toepel of the Lakeside faculty, included the honored veterans as well the entire student assembly, the Warrior Band, faculty and staff. 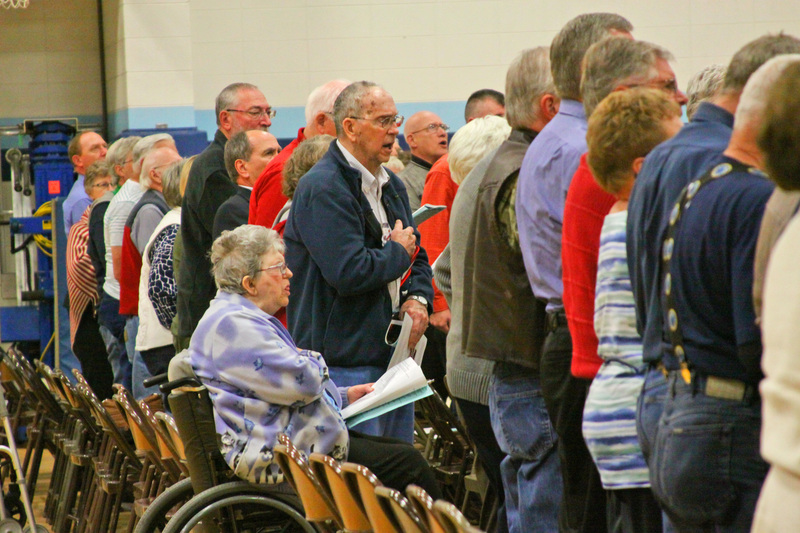 Attendees of the Lakeside Lutheran Veterans Day Observance activities sang the National Anthem as the school band accompanied during the chapel service.